Over the 26 years or so of its existence Opera Rara has been true to its name, building up a formidable catalogue of neglected, forgotten and even �lost� operatic works. In its early years the company focused on the compositions of Donizetti (1797-1848). Their current catalogue contains complete recordings of eleven of his stage works. However, the lifetime of Donizetti covered a period of frenetic operatic activity, particularly in Italy. The interest of the likes of Callas, Sutherland, Caballé and others kept his name alive, although many of his seventy or so stage works were long forgotten. But for the efforts of Opera Rara this would have been the fate of Donizetti�s contemporaries such as Pacini (1796-1867), Mayr (1763-1845), Meyerbeer�s �Italian Operas�, and Mercadante (1795-1870). He was born illegitimate in Bari. Aged eleven, Saverio Mercadante went to the �College di St. Sebastino� in Naples where he attracted the interest of Rossini, four years his elder. His first opera �L�apoteosi d�Ercole� (1819) was well received, but it was with his seventh �Elisa e Claudio�, presented in Milan two years later, that his fame spread. Work took Mercadante to Spain and then Portugal where his �Gabriella Di Vergy� was presented at the Teatro San Carlos, Lisbon in 1828 (tr. 8). After this he settled back in Italy presenting �Zaira� in 1836 (trs. 5 and 9) and �Emma D�Antiochia� in 1834 (trs. 4 and 6). Mercadante then went to Paris at the invitation of Rossini, but his �I briganti� was a failure despite a cast including Grisi, Rubini and Lablanche. However, contact with Meyerbeer�s �Les Huguenots� influenced and encouraged him in an expansion of style. The best example of this is found in one of his most famous works �Il giurmento� (1837). Regrettably, this work is not represented here. However it marked his efforts at making a significant contribution to the evolution of opera. In a letter written in 1838 during the composition of �Elena da Feltre�, and quoted on p.4 of the booklet, Mercadante explains the changes in form in �Il giurmento�. He states: �The forms are varied - Trivial cabalettas are banished, the crescendo exiled - Tessituras are less extended - there are fewer repetitions - There�s some novelty in the cadences - The dramatic aspect is better managed � The orchestration is rich, but without covering the voices - Long solo passages have been removed from the concerted pieces, since they obliged the other parts to stand there coldly, to the detriment of the action� . Some such changes can be heard here in the extracts from �Orazi e Curiazi� of 1846, (trs. 1 and 11) and �Virginia� (tr. 4) written in 1850. However, as the booklet essay states, these changes are principally in the orchestral colours, textures and harmonic progressions. Mercadante did not succeed in banishing the cabaletta as he claimed and although he varied the structures he inherited he did not alter them fundamentally. 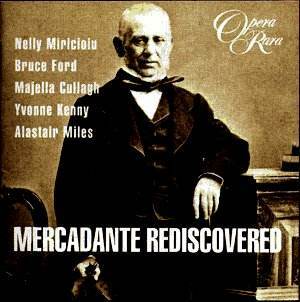 What Mercadante did opened the way for a composer who, whilst respecting the traditions could, and did; Giuseppe Verdi. In reality, it is reasonable to claim that Mercadante was the link between Rossini and Verdi whose later works took the genre of Italian opera to entirely new levels. Given the foregoing, my main regret about this disc is that it does not present the items chronologically by composition. I suggest listeners� extract that information, which is spread throughout the booklet, indeed duplicated where there is more than one extract from a work, keep a note of it and play the disc in that order. The items on this disc are derived from Opera Rara�s complete �Orazi e Curiazi� (ORC 12), substantial extracts from �Zaira� (ORC 224) as well as various recital discs from the �house� roster of singers who have graced OR recordings. All the operatic extracts are conducted with aplomb by David Parry and recorded with exemplary clarity, balance and consistency. Likewise, the singing is of a uniformly high quality. Together these combine to give an ideal sampler of the works of a composer, long neglected, who made a significant contribution to the evolution of opera. Interspersed with the operatic items are three excerpts from the composer�s �Les Soirées Italiennes�, a collection of twelve songs that Mercadante published about 1836. Sung by two tenors of different voice, character and vocal style (trs. 3 and 7) and the soprano Yvonne Kenny (tr.10) these provide a contrast with the operatic excerpts as well as illustrating another facet of the composer�s skill. The extracts from �Emma d' Antiochia� are not taken from Opera Rara�s new (2004) issue of the complete work (ORC 26) for which this disc is an excellent introduction. It also serves as an ideal introduction to Mercadante and his works and is highly recommended as such. The booklet lacks any words or translations but gives a synopsis of the action, in English, for each extract as well as details of first performance. The brief essay referred to and entitled �Traditionalist or Revolutionary? The Middle and later Mercadante� is given in French, German and Spanish as well as English.